Eastleigh's impressive start under Richard Hill continued as a hard-working performance from the Spitfires resulted in a third consecutive victory. The 3-1 score line was enough to see the club push up to 8th in the Blue Square Bet South having begun the afternoon in 13th. Having seen off Maidenhead United by four goals to two the last time out in the league, Eastleigh today triumphed over Hayes & Yeading United at the Silverlake Stadium with two goals from Jai Reason and an excellent team goal and finish from captain Glen Southam. The only change to the starting eleven from the side that moved into the next round of the FA Cup last weekend by beating Farnborough; saw former Barnet captain Mark Hughes make his first start for the club having returned from a pre-season injury. Moses Ademola was the player to make way as he begun on the substitutes bench. Eastleigh FC have today sold Daryl McMahon to Dover Athletic. After turning down two bids from Dover over the past seven days we have reluctantly accepted a third offer from them. The offer matched our valuation for Daryl and we therefore gave him permission to speak with them. Following talks, Daryl has agreed personal terms and decided to join our Blue Square South rivals. We wish him well for the future. Club Director Stewart Donald commented “We are obviously extremely disappointed to lose Daryl to a club that we perceive is one of our closest rivals at this time. However, Dover matched our valuation and we feel the deal represents good value for the football club. Eastleigh FC parted company with Ian Baird in the week after a run of three straight defeats but leaving behind a lot of good memories and service in his five year tenure. Richard Hill arrived at the club just days ago as Baird's replacement and was unveiled to the Silverlake Stadium crowd before kick off against Maidenhead United where he received a warm welcome. The dawn of a new era at Eastleigh began with Richard Hill's Spitfires getting off to a winning start in a high-scoring six goal encounter. Hill made three changes to the starting eleven who were beaten 4-0 away at Billericay Town with Andy Forbes, Jai Reason and Moses Ademola replacing Gary Elphick, Adam Everitt and Damian Scannell. By Simon Walter - Eastleigh’s new manager wants the Spitfires to pass their way out of Blue Square South . Richard Hill, formerly an assistant manager to the likes of John Gregory, Brian Little and Andy Hessenthaler in the Football League, believes that is a realistic objective – despite Eastleigh’s poor start to the season. Hill took his first training session last night and will oversee his first match as Eastleigh manager against third-placed Maidenhead at the Silverlake Stadium tomorrow, following the sacking of Ian Baird. Languishing in 16th, the Spitfires will be attempting to bounce back from three straight defeats. Hill is confident that promotion to the Conference – where he managed Stevenage Borough in the late nineties – can be achieved. “Obviously we’ve got to get promotion, that’s the remit – but that’s my remit,” he said. “We’ve got some very good players and Ian Baird deserves a lot of credit for putting an excellent squad together. The FA Cup Second Qualifying Round has been drawn today in partnership with Budweiser and sees Eastleigh take the short trip to Hampshire rivals Farnborough. Last season saw the Spitfires over come Cinderford Town at the same stage before becoming unstuck at home to Oxford City in the following round. The last time Eastleigh travelled to Farnborough’s Cherrywood Road we secured a convincing 3-1 victory. However, in March Farnborough Town visited the Silverlake and took all the points winning 1-0. The fixture promises to be an exciting tie. Other mouth watering fixtures include the Essex pairing of rivals Billericay and AFC Hornchurch in the second qualifying round draw. The match will be at Billericay’s New Lodge ground, where the sides drew 1-1 in their Blue Square Bet South meeting a couple of weeks ago. Dover Athletic will play Tonbridge Angels in another stand out tie with Tommy Warrilow’s side making the short trip south to the Crabble Ground. 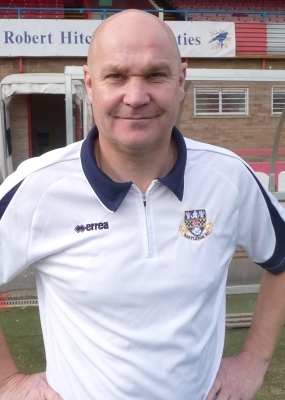 Eastleigh Football Club are delighted to announce Richard Hill as their new first team manager, with immediate effect. Richard will be introduced to the players and staff tomorrow evening and will take charge of his first match on Saturday against Maidenhead. Richard is vastly experienced having managed Stevenage Borough and assisted John Gregory at both Wycombe and QPR, Brian Little at Aston Villa and also fulfilled the same roles at Gillingham, Tranmere Rovers and Northampton Town. It is a new era for the football club and we feel that in appointing Richard we have made the right choice. We are confident that he has all the attributes necessary to ensure the football club continues to develop and move forward in the correct manner. Following a meeting at the Silverlake last night between manager Ian Baird and Stewart Donald it has been agreed that Ian will no longer be employed by Eastleigh as first team manager and has left the club with immediate effect. The Board thinks it very important to thank Ian for all his tireless efforts over the years. Ian has been a marvellous ambassador for the Football Club and has managed the team through some difficult circumstances during his tenure and has always acted in an extremely professional manner for the good of the club. We are certain Ian will be back in football very soon and wish him well for the future. The club is currently interviewing potential candidates for the position. In the interim Shaun Wilkinson will take charge of the first team squad. With the sun again blazing this time on a September afternoon in the landscapes of the Essex countryside, the start to the Eastleigh season again failed to be jumpstarted as Eastleigh stumbled to their third successive league defeat this time against last season's Ryman League Champions and Essex Senior Cup winners. As Eastleigh a quickly learning, there will be no games in the league this season where they will be allowed to perform under par and come away with any points. That is not to say that this was a high class Eastleigh showing but they can count themselves extremely unlucky having to return to Hampshire without any points at all never alone all three. Mitchell Nelson had failed to recover from the knee injury suffered on Saturday against Dover though Craig McAllister also an injury concern from the previous Saturday was able to lead the strike line. Osei Sankofa made his debut for the Club following his summer signing from Boreham Wood, the ex Leyton Orient defender assuming the right back role caused by the absence of Nelson. Dorchester changed their line up to play with a lone striker thus a defensive minded home formation in an attempt to deal with the threat of Eastleigh. As you may or may not be aware, we have put together some very exciting schemes and initiatives that I will bring to you as we progress through the early part of the season. The first of these initiatives that I am delighted to announce is with our commercial partners and local stationary company A&A Business supplies. A&A is one of the UK’s leading independent office supplies company offering its clients an unrivalled total supply solution. Any individual or company placing an order with A&A will result in the club receiving a percentage of the total order when Eastleigh Football Club are mentioned. This is a great way for the club to benefit whilst also providing the fans with a price that is likely to be lower than their current providers. Eastleigh looking for their third successive league victory welcomed fellow championship favourites Dover Athletic to The Silverlake Stadium, the side remaining unchanged for the third successive game also with Mitchell Nelson recovering from his midweek knock, the only change to the squad seeing Damian Scannell being called into the substitutes to replace Glen Southam.